A spectacular document relating to the history of astronomy is brought back to light : the Dunhuang chart, a complete star atlas discovered in China in 1900 among 40 000 precious manuscripts hidden in a Buddhist monastery, along the Silk Road. Sealed in an hidden cave around the 11th century, these manuscripts, mostly religious Buddhist texts, were miraculously preserved thanks to a dry climate. A group of scholars led by Jean-Marc Bonnet-Bidaud performs a detailed study of this unique document kept at the British Library in London. The analysis of the star chart reveals that it contains more than 1300 stars and is dated to the Tang Dynasty (649-684) using precise mathematical projection methods. 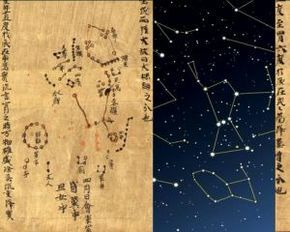 It is the oldest known star chart from any civilisation and the first pictorial representation of the classical Chinese constellations.